The Greater Newtown Exchange Club - Times Publishing Newspapers, Inc. The mission of the Greater Newtown Exchange Club (GNEC) is to support awareness and prevention of child abuse and to assist Bucks County families and youth through community service and support to area charities, including: A Woman’s Place, NOVA (Network of Victim’s Assistance), Family Services of Bucks County, Camp Discovery, Interfaith Housing, Pickering Manor, Bucks County Assn. for the Blind and Visually Impaired, Cub Scout Pack 20, Bucks for Kids, and National Exchange Club Foundation. The Club engages in community initiatives including collections for local food pantries, A Night at the Ballpark for Big Brothers Big Sisters, a charity golf tournament (in conjunction with Rotary Club of Shady Brook), a Pancake Breakfast with Cub Pack 20 that supports GNEC and Pack charities and a Christmas Breakfast with Santa event in conjunction with other service organizations. Other fundraising initiatives include sales of historic Newtown and Bucks County license plates, special edition Christmas ornaments and a Silent Auction. GNEC also sponsors Student of the Month/Year awards for Council Rock North High School students and recognizes Council Rock students for community service. One of the Club’s signature events for 2018 was held during April, Child Abuse Awareness Month. 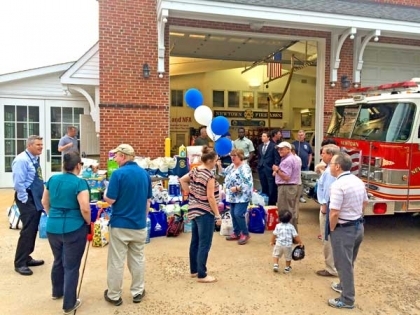 The event, entitled, “April Showers – A Time to Celebrate Women,” was held at the Newtown Fire Department. It provided support and awareness for “A Woman’s Place” by asking participants to bring re-useable shopping bags filled with personal and household products, children’s items and gift certificates for donation to that organization. It is GNEC’s goal in 2019 to continue to look for opportunities to support the awareness and prevention of child abuse and to assist Bucks County families and youth. Joining the club in 2019 will give you the opportunity to work on family and youth oriented projects including supporting the prevention of child abuse and to work with a variety of local organizations and charities to promote community improvement. To learn more about GNEC and its activities, visit the club online at www.newtownexchangeclub.org, check out their Facebook page, or telephone 215-469-1466 to receive an invitation to a club meeting. GNEC welcomes visitors and prospective members, so if you’re interested in learning more about an active group that enjoys serving others in need, the Greater Newtown Exchange Club is the Club for you. PHOTO CAP: GNEC’s “April Showers” event, benefiting A Woman’s Place.